In a twist on product placement, fictional brands made famous by TV shows and movies are being lauched into the real world. Fox Network, the US media channel behind the animated series Family Guy, is launching Pawtucket Patriot Ale in America, playing on the name of the beer company in which the show’s main character works. 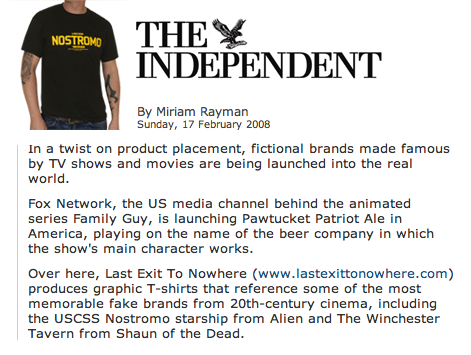 Over here, Last Exit to Nowhere (www.lastexittonowhere.com) produces graphic T-shirts that reference some of the most memorable fake brands from 20th-century cinema, including the USCSS Nostromo starship from Alien and The Winchester Tavern from Shaun of the Dead.